* Encourages neat, correct appearance as well as good behavior. * Provides the only place for proper display of awards. * Provides a visual way for boys to "belong" together. A neat, complete uniform is required for most pack activities and all pack and den meetings. This fosters a sense of pride and belonging in the boys. The Cub Scout hat is optional. 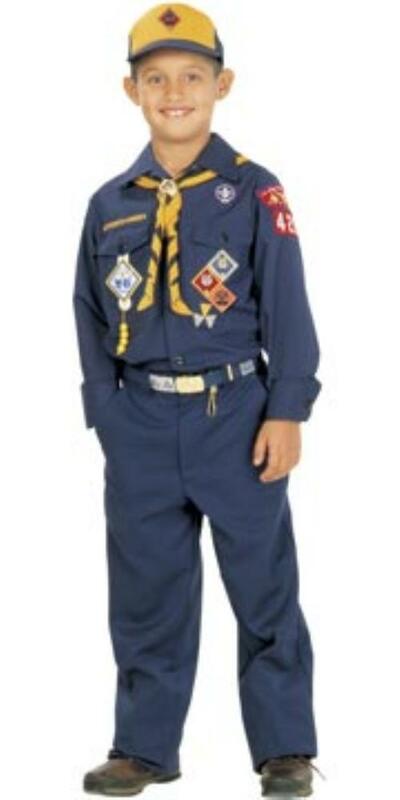 The Cub Scout belt is optional, but highly suggested!!! The Cub Scout brag vest (red felt) is optional. Cub Scout leaders wear uniforms as an example to the boys and so other Scouts may recognize them as leaders. Contact the Cub Master if you have any questions (see tab at top of this page). It is encouraged to purchase the required uniform items as soon as possible. New uniform and required items can be purchased at Cornell’s in downtown Newark or ordered online from Scoutstuff.org. You can also purchase used items through thrift stores, Goodwill or eBay. If the purchase of a uniform is a financial hardship for you, speak with the Cub Master. Through the generosity of previous Pack 100 parents, we have a "scout closet" with gently used items available. There are other options available as well and all conversations will be handled in a very confidential manner. a. Fold long edge over several flat folds to about six inches from tip of neckerchief. A tight fold prevents gathering around the neck and is more efficient than rolling or twirling.